Feel the miracle and light the candles of our special Logifaces edition. Create a form by placing each block next to each other to form a continuous surface. The Logifaces Miracle Edition offers endless different and playful arrangements for the eight days long holiday. Try to arrange the candlesticks in new decorative forms. Logifaces is a mindcracking game, to boost your creativity, and challenge yourself. The 9-piece set contains 7 different types of prisms, each of them identifiable by the height of their three vertices. The Hanukiah represent the miracle of the oil burning for eight days instead of one. Every day of Hanukkah, Jewish families get together at sunset and light the Hanukiah, one candle at a time so that on the eighth day, all the candles are burning bright. Now you can experience the fun and creativity displaying your candles in the most unique ways. Dániel Lakos from the Budapest based design studio, Planbureau designed a new Hanukkah menorah for Logideez brand. The 9 branch candlestick is blended with the original game The small Logifaces set consisting 9 prism shaped blocks inspired the designer to create a new menorah. 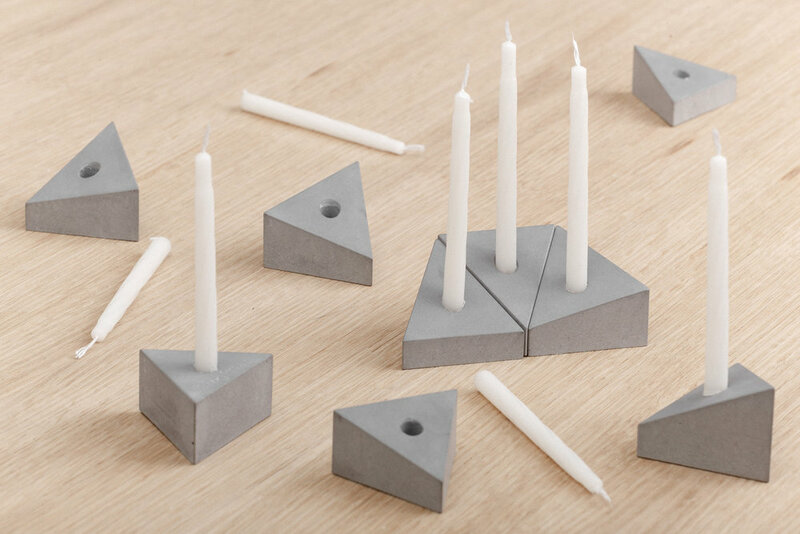 The concrete blocks from the recently designed award winning game are completed with cavities in order to hold the candles.